Combining a massive six heatpipe dual radiator design with an exquisite NF-P14/NF-P12 dual fan configuration, the NH-D14 is built for ultimate quiet cooling performance. 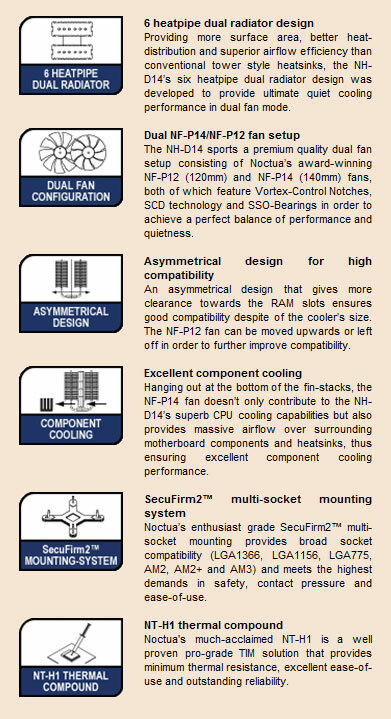 Topped off with a tube of Noctua's award-winning NT-H1 thermal compound as well as the new SecuFirm2 multi-socket mounting system, the NH-D14 is an elite choice for the highest demands in premium quality quiet cooling. 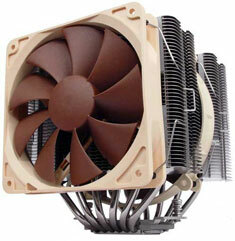 "Please check Noctua's NH-D14 Compatibility page for Motherboard and Memory compatibility"